Reuters writer Ayesha Rascoe reported yesterday that, “The U.S. Environmental Protection Agency said on Thursday it is seeking public comment on whether to allow a higher level of ethanol to be blended into gasoline. [Note: more complete details on this EPA development can be viewed here]. Yesterday’s Reuters article explained that, “The current limit of 10 percent has been in place since 1978, but ethanol manufacturers say that level must be increased to accommodate rising federal ethanol production mandates. 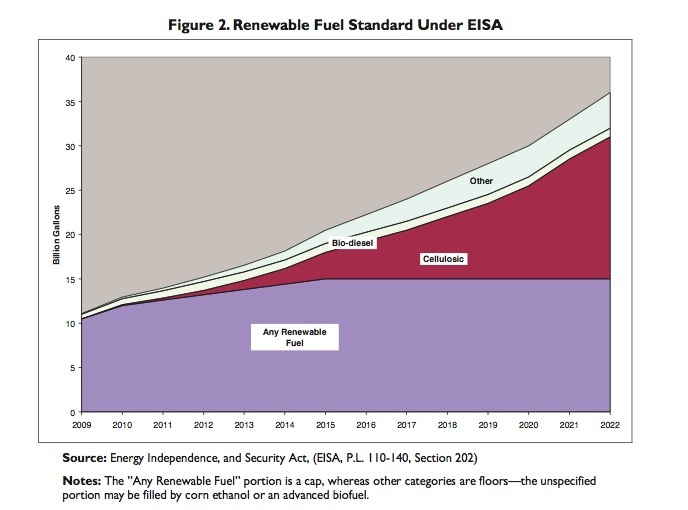 “The Renewable Fuel Standard enacted by Congress requires 11.1 billion gallons of renewable fuels such as ethanol to be blended into the nation’s gasoline supply this year. The mandate, rising annually, will reach 36 billion gallons in 2022. The Journal writers indicated that, “Pushing against the auto industry’s objections are farmers, investors in ethanol-fuel start-ups, big agricultural commodities companies and some environmental groups that argue the U.S. would be better off substituting home-grown biofuels for foreign oil. “An oversupply of ethanol has prompted a wave of bankruptcies and made the ethanol industry eager to expand its market. Ethanol producers are being squeezed as corn prices stay relatively high and as ethanol prices stay relatively low. Todd Alexander, a partner at Chadbourne & Parke LLP, estimates that some ethanol producers are losing up to 10 cents on every gallon of ethanol,” the Journal article said. James R. Healey reported on this development at today’s USA Today Online and noted that, “Automakers — who would be on the hook for E15-related warranty claims — are testing blends up to E20 in conventional vehicles. The Department of Energy also is conducting tests, but it could be a year or more before results are in. Mr. Looker pointed out that, “Senator Tom Harkin, the Iowa Democrat who heads the Senate Agriculture Committee also welcomed the news Thursday that EPA is moving ahead with the request. The Associated Press reported yesterday that, “The battered peanut industry has a new message: Peanuts are safe to eat, and there’s a law in the works to make them even safer. So have a handful. “The nation’s 10,000 peanut growers get nearly $1 billion a year for their crops, with products like peanut butter and candy generating billions more, according to Stanley Fletcher, a University of Georgia agriculture professor specializing in peanuts. With respect to food safety legislation, the AP article stated that, “The most prominent food safety bill is one sponsored by Senate Majority Whip Richard Durbin, D-Ill., backed by Republican Sens. Saxby Chambliss and Johnny Isakson of Georgia. It would require companies to have food safety plans, empower the Food and Drug Administration to recall tainted products and require annual FDA inspections of facilities it considers high risk. After additional analysis, yesterday’s AP article concluded by noting that, “Peanut farmer Jimbo Grissom of Seminole, Texas, chairman of the Western Peanut Growers Association, wrote to President Barack Obama asking him to reassure consumers that peanut butter from supermarkets is safe. In a radio address, Obama had said his daughter Sasha often eats peanut butter sandwiches and said parents shouldn’t have to worry about their childrens’ lunches. [Note: See this FarmPolicy.com update from March 20 for complete details on this issue]. “‘We want to make sure that your statements do not lead Americans to believe that the peanut butter on their supermarket shelves is unsafe,’ Grissom said in a letter distributed to newspapers. More broadly on the food safety issue, Reuters writer Christopher Doering reported today that, “Efforts to overhaul the U.S. food safety system could suffer unless major gaps in state and local programs are repaired and integrated with changes taking place in Washington, experts said on Friday. “State and local agencies have difficulty preventing and responding to outbreaks of foodborne illnesses because of chronic underfunding, varying levels of resources, different methods in addressing food safety and barriers preventing collaboration, the researchers said in a report. “‘It really starts with the reality that they are the foundation of the system,’ said Michael Taylor, a professor of health policy at George Washington University who helped write the report. And in a related article, Andrew Martin reported in today’s New York Times that, “With huge losses from food-poisoning recalls and little oversight from the federal Food and Drug Administration, some sectors of the food industry are cobbling together their own form of regulation in an attempt to reassure consumers. They are paying other government agencies to do what the F.D.A. rarely does: muck through fields and pore over records to make sure food is handled properly. “These do-it-yourself programs may provide an enhanced safety level in segments of the industry that have embraced them. But with industry itself footing the bill, some safety advocates worry that the approach could introduce new problems and new conflicts of interest. And they contend that the programs lack the rigor of a well-run federal inspection system. The Associated Press reported yesterday that, “A new survey of rural bankers in 11 Midwest and Plains states suggests the region’s economy remains weak, but there are also signs it may soon improve. The AP article noted that, “Creighton University economist Ernie Goss says he thinks the overall rural economic index has bottomed out even though it remains in negative territory. In increased to 21.7 in April from March’s 18.7. Nonetheless, Jim Downing reported today at the Sacramento Bee Online that the dairy industry is still suffering from low prices. The Bee article added that, “But milk is still selling for far less than it costs to produce. As production outpaces demand, analysts and farmers expect the market to stay weak for the next few months. “‘We’ll just be prepared for an ugly financial situation,’ said Case Van Steyn, who milks about 1,000 cows in the Galt area. A news release issued yesterday by USDA stated that, “Agriculture Secretary Tom Vilsack said that a USDA study being released today found that participation in USDA’s Special Supplemental Nutrition Program for Women, Infants, and Children (WIC) is not related to being overweight. The Washington Post editorial board noted today that, “As soon as next week, the Environmental Protection Agency could follow through on an order from the Supreme Court to either declare carbon dioxide a pollutant or to say why it isn’t. That decision could usefully signal to the world that the United States is serious about regulating greenhouse gas emissions. But it should also send a shiver down Congress’s collective spine. Because the regulation of carbon will have a profound effect on the American economy, this vital task should be the responsibility of Congress, not of unelected officials at the EPA. For more background on this issue, see this FarmPolicy.com update from April 8. An editorial posted yesterday at The Financial Times Online stated that, “As we agonise about the recession, we should remember that humanity’s greatest economic problem is more basic: how to get enough food, a challenge still faced by millions. The FT item noted that, “Food exporters and importers alike need well-functioning international markets in food, which encourage efficient global production patterns. The responses to the crisis, sadly, have been in the opposite direction: export bans, land grabs of arable territory and secretive bilateral barter deals. These policies must stop. They are self-destructive and costly, and for poor countries ruinous. They do harm to others, as they undermine trading systems that benefit all. “Governments must provide global public goods. Research is needed to boost productivity, especially for African crops, and must not be hampered by opposition to genetically modified food. Mechanisms must be found to hedge against price volatility that discourages production even when prices are high.